Lil' Blog and More: Free Blogger Opportunity! You may have noticed that I've been participating in a lot of blogging events. I love bringing as many giveaways to you as I can, so this has been a great way for me to do, just that! I've actually had a few of you ask where I find all the opps too - So every once in a while, I'll share a few with you in posts, and then you can also find some on my "Blogger Opps" page! I hope to join in with some of you :)! Please say Rats and More sent you : )!! 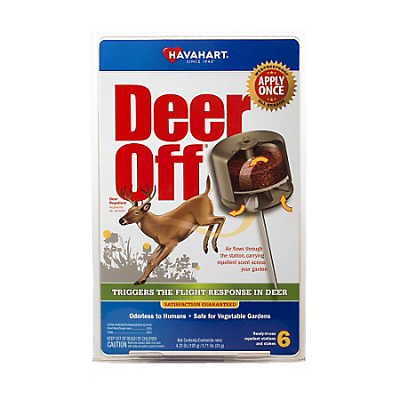 These unique, patented stations contain 100% natural ingredients that trigger the flight response in deer. Hang or stake the deer repellent stations in and around your yard or garden, for season-long protection. Havahart is the most innovative brand in wild animal control. They have been recognized and trusted by consumers for over 60 years! I've changed things for this giveaway. If it works well I will continue to do it this way. You can choose Any TWO Social Media Accounts* or Newsletter Subscription"